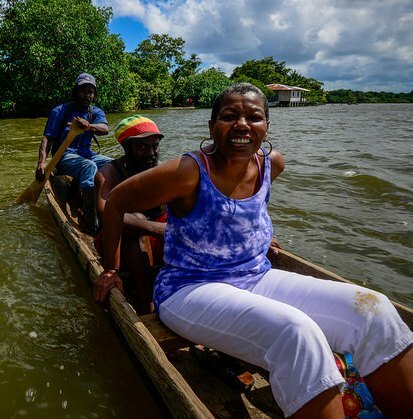 Part III: Climate Change Displacement from Batalla and Tocamacho: Two Garifuna Communities On the Front Line. 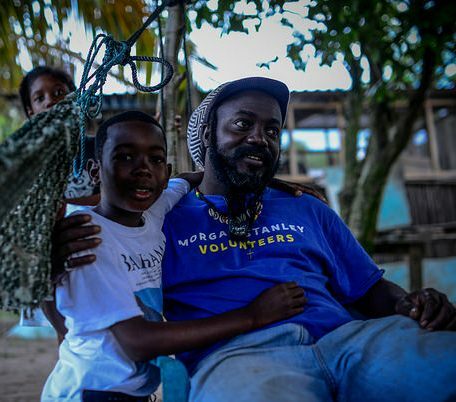 Selvin of OFRANEH and his son Benedict in Batalla, Photo by Steve Pavey. Our last morning in Batalla we were introduced by our OFRANEH companion Selvin to Roberto Ariola and Leslie Flores, a young couple who were settling in to a new hamlet called Dagadagati as refugees of the storm provoked by tropical storm Gamma in 2005. 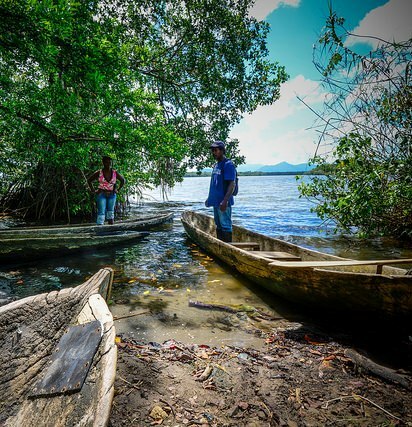 They had paddled dugout canoes over from Dagadagati, and wanted to tell us their story. We agreed to visit their place across the Lagoon and they said they would paddle us over. 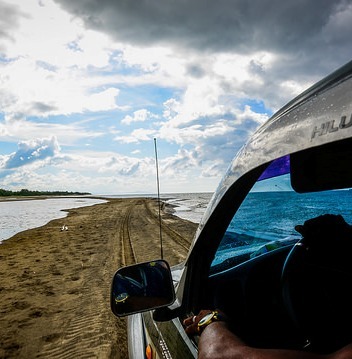 No problem for Roberto and Leslie to take us to their resettlement community across the big Lagoon. Photo by Steve Pavey. We were surprised that Leslie, the captain of our dugout, admitted to not knowing how to swim, additional motivation to not have us tip over. These boats felt very very tippy. Our guides kept us from tipping on the way over to Dagadagati community. Quite a number of families displaced by Gamma had settled in Dagadagati community. Their children would paddle their dugouts in order to attend school on the far east side of the Lagoon. We were impressed at the intensive and orderly agriculture taking place in Dagadagati community. 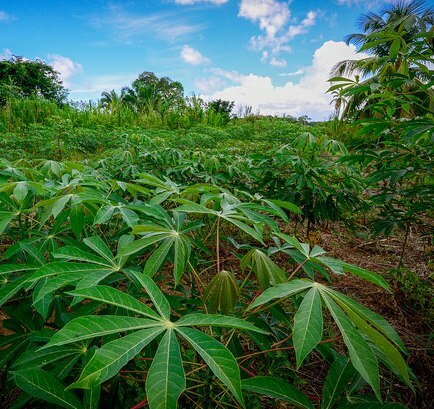 Cassava, plantains, coconuts were in abundance in Dagadagati, settled after 2005 storm. Photo by Steve Pavey. OFRANEH had helped these folk get some support for housing from a Honduran government program, but the house design was poor (the houses were far too small and divided into tiny impractical rooms within). 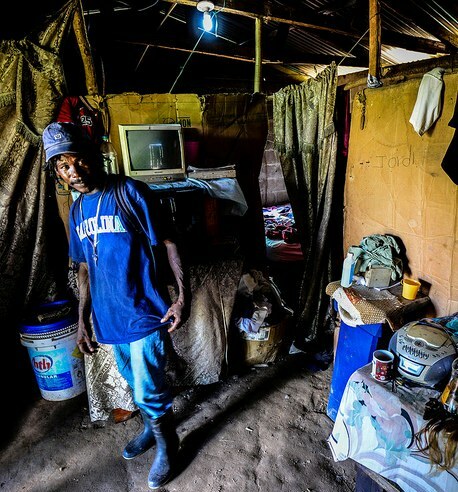 In addition, the funds dried up before the houses even had doors and windows, so the displaced settlers had to figure out how to do the finishing themselves, according to their means. Here is the entranceway to the home of our guide Roberto, still without a paved floor. 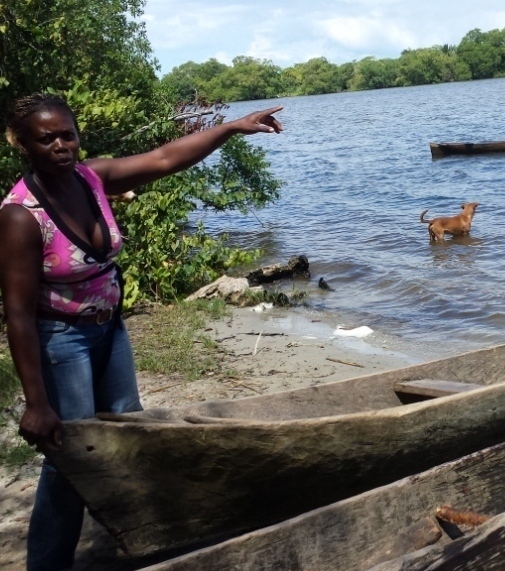 Residents of the new community reported that they were having a land dispute with non-Garifuna folk who had moved into the area, limiting the amount of land available for their agricultural production. Kitchen gardens had been planted, with a variety of vegetables being grown, including okra, peppers, tomatoes, cucumbers and of course the staples of cassava, bananas, plantains. 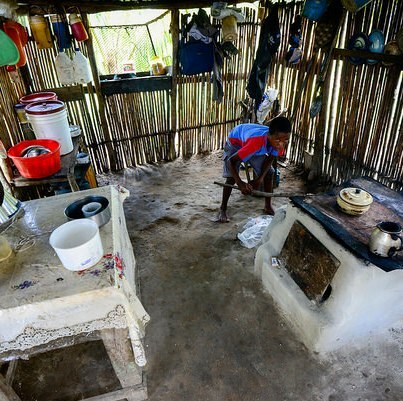 Their kitchens separate from their houses were very functional. We met a nurse in the community who was also working with the local residents on basic health and prevention, and had a special mosquito net treated with chemicals in order to kill malaria-carrying mosquitos. 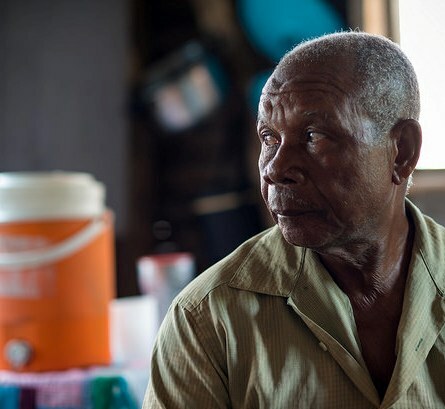 Selvin, the OFRANEH guide, discussed the possibility with the nurse/health promotor of finding ways to treat poisonous snake bites by traditional means, as there are very poisonous snakes in this area. The yards of the residents were kept clear of any vegetation in order to minimize the likelihood of snakes coming too close. Finally it was time to return to Batalla and this time I got to paddle along with Leslie, which was helpful as we were heading right into a brisk wind. 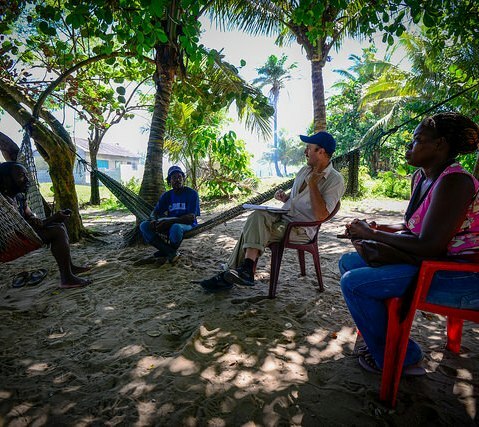 Later that day as we traveled west along the beaches of the narrowing peninsula between the Caribbean Sea and the Fresh water Lagoons inland, we got testimony from the President of the Patronato (local council) of Tocamacho. Geronimo Palacios, President of the Patronato of Tocamacho. Photo by Steve Pavey. Geronimo told us that when he was young, from his house you could not even see the Sea, observing that the Sea had taken away a great deal of land, including many homes and trees, etc… over the years. Standing besides his house, we could see the Caribbean only about 150 feet away. As we continued our way westerwardly, we saw strong evidence that what Geronomi had told us was absolutely true, such as mangroves dying due to exposure to the surf and erosion of the roots of almond and beachgrape trees. The level of the Sea was definitely rising, taking with it acres and across of beach front, many of which had been occupied in the past by peoples homes, and by a variety of trees. Our journey back west could not have succeeded, however, if it were not for some fancy driving on the part of Oscar Gamboa, our OFRANEH chauffeur. 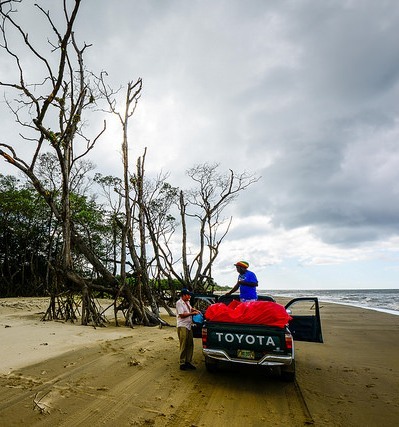 We had to navigate across the mouth of the Iriona river, and to do so required driving out into the surf and trying to keep on the sand bar and not be overcome by the sea and surf. Our four wheel drive vehicle just managed to do so, despite the right front wheel falling off the sandbar into deep water at one point. In the following photo, you see the Iriona River heading out to a beach head, where we were to meet our destiny… well, since you are reading this, I guess you can tell that we didn’t drown or have our camera equipment ruined by salt water.